Helen Scanlon is an author and artist based in Hampton, Connecticut. A lifelong horse lover, dressage rider and former groom, Helen writes and illustrates primarily equine-related books that appeal to both adults and children. At the age of ten, she wrote and illustrated a book in a hardcover composition notebook called Golden Beauty, a story about a carriage horse with a glimmering gold coat. Her book was awarded its own library card catalog number at the Hawley School in Newtown, Connecticut for a full school year. This early accomplishment inspired Helen to pursue her dream of becoming a published author. 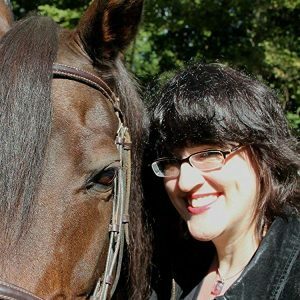 Helen’s first book, My Horse, My Heart: The Morgan Horses of the University of Connecticut was published in 2013, and garnered many positive reviews from readers. Her popular illustrated children’s books The Great Red Horse: A Colt is Born and The Great Red Horse: A World Champion, parts one and two of The Great Red Horse trilogy, soon followed. The third and final installment, The Great Red Horse: The Legacy, is slated for publication in 2018. The Great Red Horse books chronicle the life of UC Ringmaster, the two-time World Champion Morgan stallion bred by the University of Connecticut. Helen’s highly-anticipated fourth book, Dust and Determination: A History of UConn Polo, is in the final editing phase and on-track for summer/fall 2017 publication. Also an accomplished artist, Helen’s books feature her whimsical full-color illustrations and expressive pencil sketches. 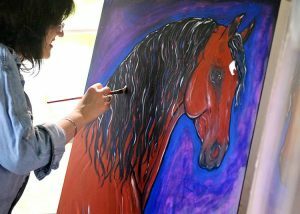 Her work has been featured in Polo Players’ Edition and Connecticut Horse magazines. When Helen is not writing or illustrating books, she can be found snuggling her cats, painting in her studio, running with the Beastie Boys on the i-Pod, riding a beautiful chestnut Morgan mare, or posting disco videos on Facebook. Helen has a degree from the University of Connecticut in sociology and art history, and enjoys home life with her husband, designer and photographer Steve Scanlon, and their three cats Mousekowitz, Big Boy, and Thomas.